Hello and welcome to The Academies, a Football Manager 2017 series which takes a look at some of the world’s best football academies and sees how their best prospects progress on FM17. In this post we look at FC Barcelona. La Masia de Can Planes is often considered to be the world’s best football academy and has produced the likes of Lionel Messi, Andres Iniesta and Xavi in recent years. But are there any future superstars currently learning their trade in La Masia? We follow the careers of four hot prospects to have come through the Barcelona academy on Football Manager 2017. The Players | Who could be the next world class talent to emerge from the academy? Abel Ruiz is 16 years old and plays as a striker. He is also capable of playing as a winger on either side of the pitch, and with impressive dribbling skills it’s plausible that he will be retrained to play in this position. Chumi has the attributes to be a decent full-back, but it will be a huge surprise if he plays for the Barcelona first team. Naturally a centre-back, Chumi will need to retrain due to his poor heading. Inaki Pena has very decent core goalkeeping attributes for his age. With plenty of time to grow, Inaki could well be the star of our four youngsters but will need regular first team football in order to develop. Can he get enough playing time at Barcelona? 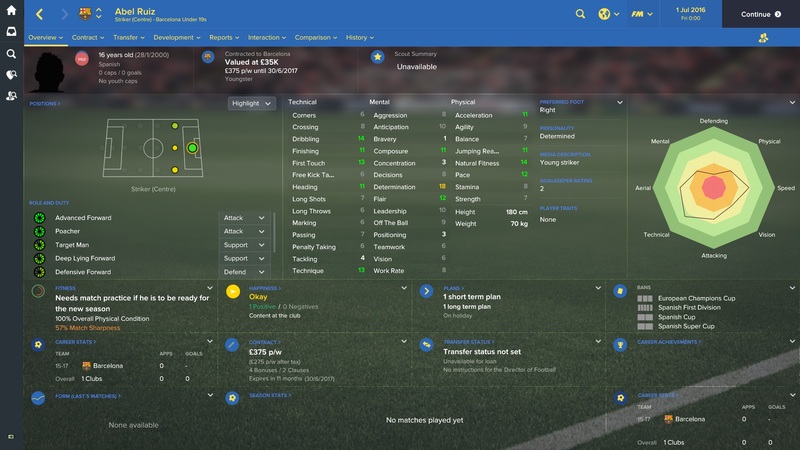 Munir is a name that most FM players will have heard of. He has been one of the high potential players in the Barca academy for the last few editions of Football Manager so it will be interesting to see how the 20 year old progresses this year. Five years on | Which of our youngsters has developed the most so far? Abel has spent time on loan at two different clubs: Granada and Huelva. His contract with Barcelona ends in 2021 and it looks as though he is going to be released. In his most recent season, he scored 15 goals in 34 games for Huelva in the second tier of Spain. Is this where his future lies? In five years Chumi has developed into a decent centre-back. 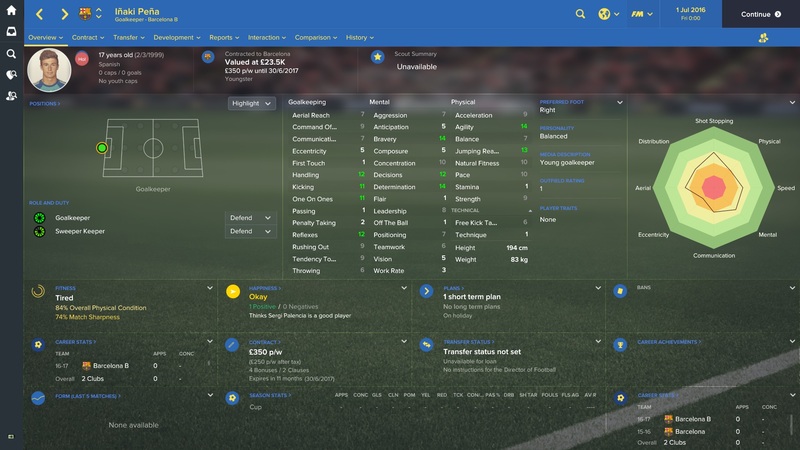 His heading attribute (highlighted as a weakness earlier on) has developed very well and now sits at 10. High attributes in tackling and marking somewhat make up for this. Young goalkeeper Inaki Pena finds himself in Italy with Napoli. As expected, he has played largely a backup role both with Barcelona and now with Napoli. Munir left Barcelona in 2018 to sign for fellow Spanish La Liga side Real Sociedad. He has become a crucial member of their side, playing in 35 out of 38 games in the most recent season. Retirement | Did our wonderkids become superstars? Abel Ruiz played in just two countries throughout his career. After leaving Barcelona in 2021, Ruiz played for two clubs in Spain before moving to Greece. Though he won’t be remembered by many Barcelona fans, Ruiz has become a well-known figure in Greek football, playing for three different clubs over 9 seasons. 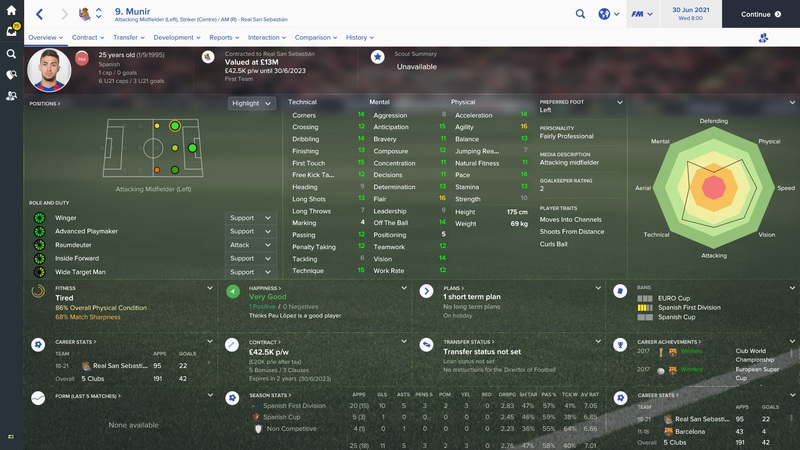 Chumi surprised me over the course of his career. As a youth player he never looked like he would develop into a centre-back, instead looking more like a full-back. But he played the most out of our four prospects and went on to have a very good career throughout Spain. Goalkeeper Inaki Pena spent the early years of his career as a backup goalkeeper, both at Napoli and Olympique Marseilles. But he found a home in Turkey with Bursaspor and became their first choice goalkeeper for six seasons. Munir left Barcelona in 2018 and became a very important member of the Real Sociedad side. He then moved on for £24M to Portuguese giants Porto before ending his career with Pacos de Ferreira. Thanks for reading our FC Barcelona instalment of The Academies. Have you used any of these youngsters on FM17? Which other Barcelona youth prospects have you seen develop into world-class talent? 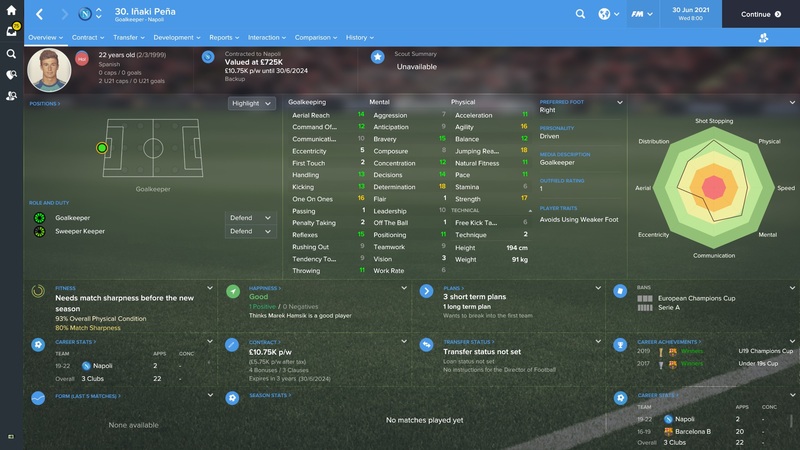 This entry was posted in FM17 Guides, Experiments & Wonderkids, Football Manager 2017, The Academies and tagged abel ruiz, barcelona, chumi, fm wonderkids, fm17, football manager, inaki pena, munir, spain. Bookmark the permalink.